Amparo was born in Bogota Colombia and came to Britain in 1974. She started practicing and studying Iyengar Yoga in the 1980s and found this method the most beneficial as it emphasises the proper alignment in Yoga asanas. 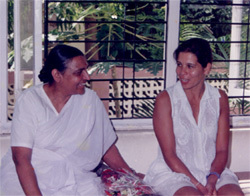 She has studied with Guruji Iyengar and his daughter Geeta in India, Germany, Russia and England. Amparo holds Teaching Certificate Junior Intermediate Level 3, which includes remedial and pregnancy teaching. She also trained teachers in Mexico and is an assessor in the UK and in Ireland. Amparo also offers individual, private and corporate Iyengar yoga classes. To arrange a visit send an e-mail to info@yogamparo.co.uk or call 07946 766 377. Sunday mornings Virgin Active N. H.
Amparo in Pune with Geeta Iyengar.